If you are trying to create a tropical looking garden, but live in a north European climate, a little research will tell you that your options are going to be limited. Cannas, bamboo, and hardy palms are now a mainstay of council planting schemes, so to avoid having a garden that looks almost identical to a local roundabout you are going to need to be a little more adventurous. This is where Colocasia esculenta cultivars can come into play. Large leaved, and tropical to the core, the Colocasia is an elegant herbaceous perennial that will thrive in reliably moist soils. 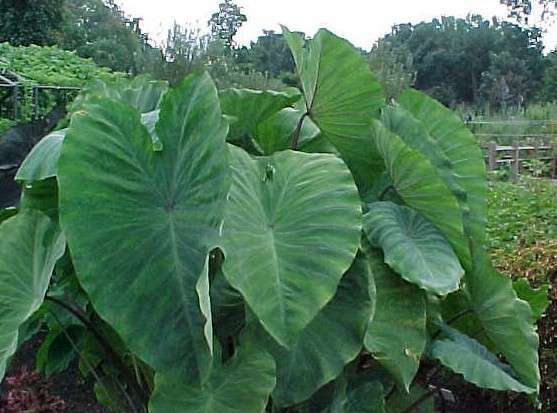 Colocasia is a genus native to tropical Polynesia and southeastern Asia. The roots of the Colocasia esculenta are in fact edible and have been cultivated in Asia for more than ten thousand years. Its common name the 'Elephant's-Ear plant' gets its name from the leaves which can be as large as 60 inches, which are shaped like a large ear or shield. To get the best out of your plants in the garden they require three fundamental growing conditions, a rich soil, plenty of sun and plenty of water. Be aware that the leaves of Colocasia esculenta are designed to shed water, so even after quite a heavy rain shower it is not uncommon for the soil at the base of the leaves to be bone dry. It is essential to the plants to get underneath the leaves with a hose and really soak the soil, especially in hot spells. If you hold back on the watering, your once stunning centrepiece will be looking ready for the compost heap! You will probably find that soon after planting your plants may look as though they have stopped growing or even started dying off! Don't worry as this is quite normal as Colocasia are renowned for suffering from root shock. Keep them watered and in a couple of weeks things return to normal. The plant can be grown in the ground or better still in large containers. They are grown outside year-round in subtropical and tropical areas but in temperate European regions, they are planted out for the summer and then lifted and stored over winter. Growth is best at temperatures between 20 to 30 °C (68 to 86 °F), but the plants can be damaged if temperatures fall below 10 °C (50 °F) for more than a few days. 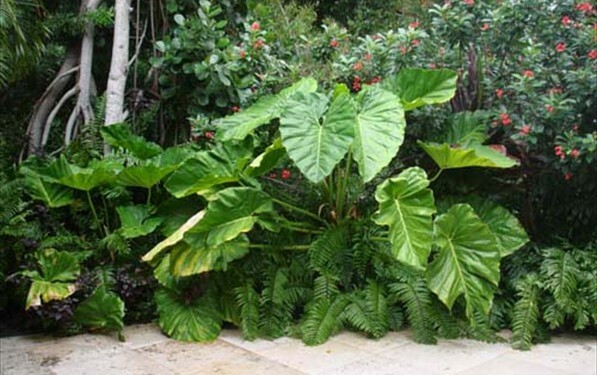 If you have bought your Colocasia as a section of root then plant it in a good sized pot, 10 inches or so, using a good quality compost such as John Innes 'No 3'. You can also add a small handful of growmore, and vermiculite/perlite to improve water retaining qualities. The root tuber is typically planted close to the surface. The first signs of growth will appear in 1 to 3 weeks. When planting in the borders, the adult plant will need a minimum area of at least 10 sq ft of space. They do best in a compost-rich soil and preferably in the shade so that the soil doesn't dry out so quite so fast. Grow it in the sun and you will need to be on the ball with regards to watering. The plants should not be left to go dry for too long; if this does happen, the leaves will wilt; watering will allow the plant to recover if done before they get too dry. Periodic fertilization every 2 to 3 weeks with a common plant fertilizer will increase foliage growth.